A 90 year old character building in Wynyard Quarter has been given new life, while providing sustainability and durability for the future. 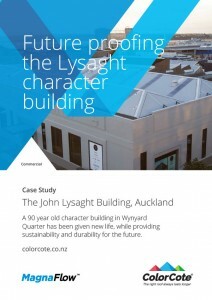 The Lysaght building in Wynyard Quarter was built in the 1920s, deriving its name from the original tenant, the John Lysaght steel company. Over the years it has served as a variety of mostly industrial or marine uses, and was used by Italian America’s Cup challenger Luna Rossa to carry out repairs. The building, with its classical façade, rustic masonry and worn beams, has immense charm and was one of five buildings deemed to have character value in the Wynyard Quarter provisions of the Auckland District Plan. Warren and Mahoney, the architects in charge of the refurbishment works, have retained many of the defining features of the building, including previously unreinforced masonry, which has now been upgraded to meet earthquake standards. Project Director Daniel Khong says the intent with the project was for Waterfront Auckland to take a lead role in showing how restoration could be done sympathetically and with environmental aspects in mind to achieve a 5-star Greenstar rating. “The building is a key part of the fabric of the area with its prominent corner site and it is only appropriate it lives on as a thriving work space for creative and innovative business”, Khone says. ColorCote MagnaFlow was selected to not only enhance the contemporary design of the building, but to provide sustainability and durability for the future. The superior corrosion resistance of MagnaFlow means it is ideal for more demanding environments, such as roofs 100m from the coastline. The magnesium in the aluminium/zinc/magnesium alloy coating helps zinc flow over cut edges, sealing them and providing long term protection against corrosion. Additional sustainable features include louvres and sliding doors for natural ventilation, an energy monitoring system and a waste sorting room.